VIPAccessEXCLUSIVE: Amazing Musicians, Legendary Tennis Players And A Whole Lot Of Unforgettable Moments – It All Happened At The 2017 Arthur Ashe Kids’ Day – RECAP Here! The US Open is in full swing and it’s definitely the greatest time of the year for us tennis fans. 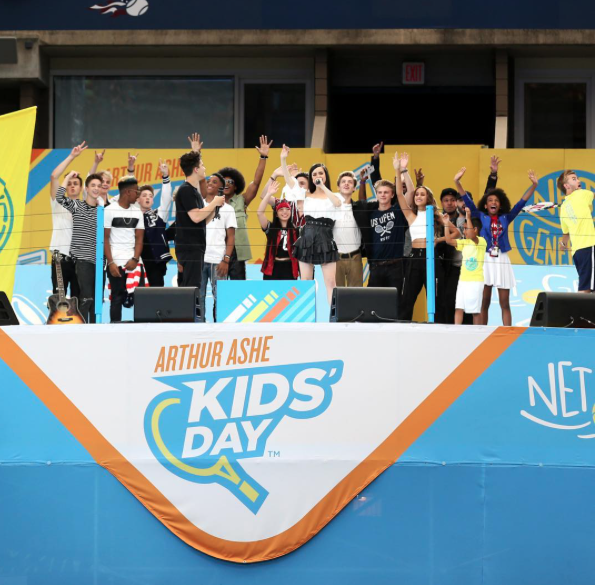 Well, one of the most remarkable days during the US Open just recently took place and yup, you guessed it, we’re talking about the phenomenal Arthur Ashe Kids’ Day! The outstanding Arthur Ashe Kids’ Day is one event that defines pure excitement. It brings together some of the most talented, fan-favorite, musical artists along with legendary tennis players all under the Arthur Ashe Stadium’s roof. Whether you’re watching the Arthur Ashe Kids’ Day in person or live on TV, this exceptional event will always put a big smile on your face and it will never fail to leave you in awe. On August 26, 2017, fans filed in the Arthur Ashe Stadium for one of the most unforgettable days ever. Each and every year, the Arthur Ashe Kids’ Day brings pure fan-demonium and tennis fun and the extraordinary event manages to get even bigger and better as each year goes by. Without a doubt, this year’s Arthur Ashe Kids’ Day was the best one yet with some of the biggest acts in the music world. Musical sensations including Alex Aiono, Jack and Jack, Why Don’t We, Sofia Carson, New Hope Club, Spencer Sutherland and Saving Forever left everyone mesmerized with their out of this world and breathtaking performances. They all had everyone up on their feet singing along to their hit songs and everyone was definitely fan-girling and fan-boying over the excellent performances. The fantastic, musical event was also hosted by Alex Aiono and Sofia Carson, who brought even more fun to the show. Everyone’s heart rates went up from excitement when tennis icons including Rafael Nadal, Roger Federer, Venus Williams, and Angelique Kerber brought their unrivaled and indescribable tennis skills and talent to the court. These tennis greats had a wonderful time taking on a fun tennis challenge with a young tennis player himself who blew everyone away with his great talent. Not everyday do you get to see some of the most renowned and consummate tennis players together only a couple of feet in front of you, and when you do, it’s at the Arthur Ashe Kids’ Day – one of the most excellent events on this planet. It’s so wonderful to see all of these incredible tennis players join together to show their support towards kids following after their dreams and wanting to pursue a career in tennis too. It’s definitely a once in a lifetime experience to see, let alone, have the chance to even play, with tennis players you look up to. It goes to show that the Arthur Ashe Kids’ Day is a sensational event that encourages everyone to work hard, get up and get active, and go after their dreams, and amazing things can be achieved. Arthur Ashe was a stupendous tennis player who made history with his record-breaking achievements. In addition to being a stellar tennis star, he also was a great inspiration to everyone and he definitely impacted the lives of many. His legacy continues to live on and what Arthur Ashe has contributed to the sport of tennis and to people in general who just want to follow after their dreams and accomplish big things is truly awe-inspiring. I, Alexisjoyvipaccess had the greatest honor of covering the prestigious 2017 Arthur Ashe Kids’ Day event again for the third year in a row. The Arthur Ashe Kids’ Day is definitely one of my favorite events, for obvious reasons. It’s filled with magnificent memories, great musical performances, adrenaline-filled tennis activities, and it inspires everyone in more ways than imaginable. There is always a special feeling in the air whenever it’s time for the Arthur Ashe Kids’ Day! Check out some VIPAccessEXCLUSIVE pictures below from my coverage of the 2017 Arthur Ashe Kids’ Day and be sure to stay tuned for interviews with your favorite celebrities from the event on YouTube.com/alexisjoyvipaccess! Follow the Arthur Ashe Kids’ Day on Twitter and Instagram: @AAKidsDay and join in on the conversation by using #AAKD! Previous Article: Find Out Won At This Year’s Renowned And Prestigious 2017 Premios Tu Mundo Awards! Next VIPAccessEXCLUSIVE: Why Don’t We Interview With Alexisjoyvipaccess At The 2017 Arthur Ashe Kids’ Day!